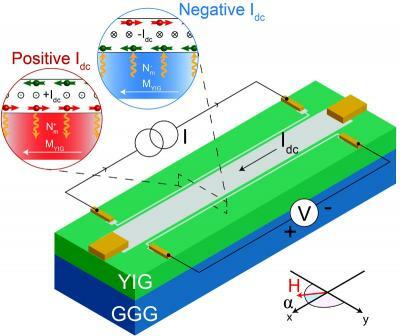 Researchers from the University of Groningen developed a spin transistor based on magnons (spin-waves). This transistor allows the researchers to alter the flow of spin waves through a magnet - with only an electrical current. To create the transistor, the researchers used films of platinum that inject magnons into a magnet made of Yttrium Iron Garnet (YIG). A third platinum strip, inserted between the injector and detector allows the researchers to either inject additional magnons in the conduction channel or drain magnons from it.